London South Bank University (LSBU) is supporting the Southwark Business Excellence Awards 2019 as headline sponsor. The awards kicked off with a launch event held at The Shard on Thursday 24 January and the first round of awards will take place next June. Designed to celebrate the successes and achievements of Southwark’s 18,000 local businesses, the Southwark Business Excellence Awards aim to recognise and reward the wide range of firms based in the borough, which stretches from South Bank to London Bridge and Surrey Docks in the east, and to Bermondsey, Peckham, Camberwell and Dulwich in the south. These awards are free to enter and open to companies of all sizes and across all sectors in the borough. 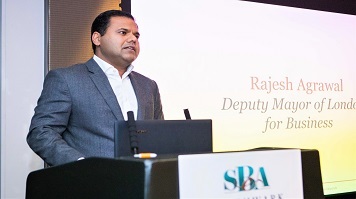 More than 200 guests attended the launch event to hear speeches from business and political leaders and a welcome from Rajesh Agrawal, Deputy Mayor of London for Business. Also in attendance were awards partners, Southwark Chamber of Commerce and Southwark Council. The awards are sponsored by London South Bank University, British Land, Delancey, Landsec, Great Portland Estates, London College of Communication, UAL and Willmott Dixon. They are supported by Forepure Brewing Co., Shangri-La Hotel at The Shard and Southwark News. The finale of the programme will involve a rigorous and independent two-stage judging process followed by an awards ceremony for 450 people hosted by TV presenter and ITV This Morning reporter Michael Underwood, next June. To find out more about the entry categories and criteria for applying, visit Southwark Awards.